“A modern adaptation of Jane Austen’s Pride and Prejudice based on the Emmy Award-winning phenomenon, The Lizzie Bennet Diaries. 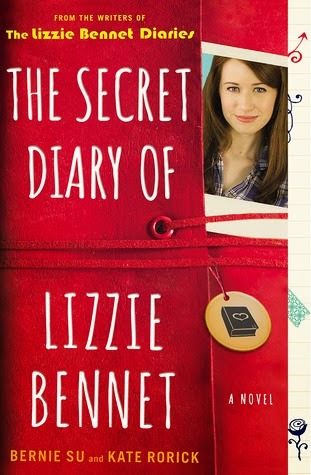 The Secret Diaries of Lizzie Bennet is a companion novel to the YouTube sensation, The Lizzie Bennet Diaries, a retelling of Jane Austen's Pride and Prejudice. I have never been a fan of diary format. Actually, the second I hear that a book is written in diary format, I run in the other direction. So, why you ask, would I possibly want to read a book that's whole premise is that it's a diary? Because it's about Lizzie and Darcy, of course! I've mentioned my obsession with all things Pride and Prejudice multiple times, so when I discovered The Lizzie Bennet Diaries on YouTube I watched all the episodes in two days. Then, when I discovered this "secret diary" companion, I had to have it. And guess what? I loved it! And that's really my only problem with the book. Huge chunks of the beginning felt like filler in between Darcy showing up or any character doing anything, really. Lizzie likes to talk about her school work, but that does not make for an interesting story. Thankfully, the more characters are introduced and the more Caroline, Darcy and Lydia time we get, the more exciting the story becomes. But, near the end, when more things are happening on camera, we start to get a couple of scenes in transcript form, straight from the videos, instead of Lizzie's first person commentary. It works, but I would have liked to see more of what Lizzie was thinking and feeling during those scenes. But, we do get to see first hand accounts of the time Lizzie and Darcy spend together at Pemberley, which was an amazing kind of adorableness that will leave any LBD fan swooning. This Lizzie is the most abrasive version of Elizabeth Bennet I've ever read about, but she definitely has some major character growth towards the middle/end, and not only because she falls for Darcy. I think Lizzie mostly sees the error of her ways—yes, because of Darcy and his letter, but also—because of Lydia. LBD's version of Lydia has the most depth of any character in a Pride and Prejudice retelling I've ever watched or read, even without seeing her perspective the way you do in the videos. I remembered just how powerful her story was while reading and wanted to go back and rewatch when she and Lizzie finally talk near the end, because of the serious sisterly bonding. Then there's Fitz, Gigi and Caroline who break up the seriousness with humor, and we actually get to see more of Mr. and Mrs. Bennet in the book which was really pretty great. If you can't tell, I'm pretty in love with this particular retelling of P&P! The Secret Diary of Lizzie Bennet is a must read for diehard Pride and Prejudice fans, or fans of The Lizzie Bennet Diaries. If you haven't watched The Lizzie Bennet Diaries (go do that!) it's not necessary, but it's a lot of fun to be able to see the little things you weren't able to see while watching the series. And it might make a few odd references make a whole lot more sense. If you have seen LDB, you have to read the book because we get to see Lizzie/Darcy interaction first hand (!!!). So run! Go get your copy! You definitely don't want to miss out on any of the untold Dizzie action! P.S. please figure out how to do this for Emma Approved! Because Snarky Knightly in book form would make me very happy. Fantastic review Jesse. I received this from the publisher and haven't heard too much about it, but now will have to start reading it very soon. I love love Pride and Prejudice and haven't read any adaptations, so can't wait.